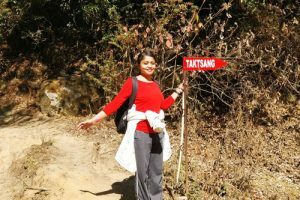 Twenty of us (aged between 22 years to 42 years) thought we were ready to visit the Paro Taktsang, also known as the Tiger’s Nest in Bhutan. Little did we know that we were really, not. Most of us assumed it would be like climbing to a temple on a small hill in India but it was not. The ticket to visit the interior is Nu. 500/- (INR 500/-) and you will need to keep all your belongings in a locker outside the monastery. The Taktsang looks like it’s miles away. A mini fountain on the way. Once we reached the base by car, we could barely see it from the Paro Valley and when we caught a glimpse of it from the cafeteria; we wondered how we were going to get onto that stone cliff standing alone in the midst of the stone hills. The Taktsang was perched on the edge of a cliff, around 3000 meters above sea level and 900 meters (approximately 3000 feet) above the Paro Valley. 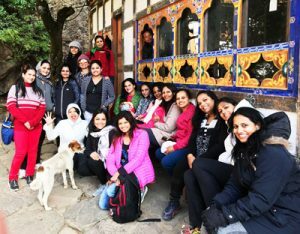 We started the trek from the Paro Valley and, after huffing and puffing and losing our breath a few times, we took four hours to reach the monastery. Halfway, through the walk, some of us thought of turning back but inspirational people were all around us. 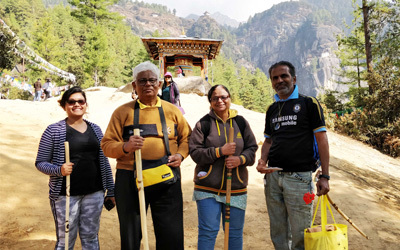 The huge Prayer Wheel behind the first set of inspirations; the 72 year old couple with the 62 year old man on the right and 22 year old Aishwariya on the left. The first stop at the cafeteria. You can see the monastery (a white dot) behind me on the cliff. The first stop was the cafeteria, which took us around two hours. On the way up, we passed several people who wished us all the best. Then, we met our first set of inspirations; an Indian couple (aged 72 years) and a man (aged 62 years) who terminated their trek at the cafeteria, which is almost 50% of the total trek. After chatting with them for a few minutes, we were magically motivated and determined to continue the climb. The crazy shortcuts you have to climb. Still on the way, wondering when we are going to find it! Fifteen minutes after we left the cafeteria, we met our second set of inspirations; a couple (Mr. Satish and Mrs. Nandini) aged 59 and 57 years respectively. It was then that we were seriously stimulated and began pushing ourselves to climb all the way up to the monastery. We met them again while we were closer to the monastery. 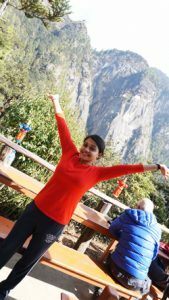 WATCH VIDEO of the last leg of the climb and 57 year old Mrs. Nandini, who took almost the same duration of time, as us, to get up there. I’m 35 and Aishwariya is 22. The first sigh of relief that we are closing in on the Tiger’s Nest. Finally, we find the place from where the iconic photo is taken. A few things to keep in mind before you begin your climb to the most sacred site in Bhutan. Timings: The best months, to trek to the Tiger’s Nest, are between October and December (while it is cold). We were there in the third week of November when the early mornings would get down to 0 degrees centigrade. Avoid climbing in the rainy and summer seasons for obvious reasons. We began our climb at 0900 hours and reached the monastery at 1300 hours. Left the monastery at 1430 and reached base at 1630 hours. It is better to get back down as soon as you can because once it gets dark, it’s spooky, there aren’t any navigators to direct you and the souvenir stalls wrap up for the day so no shopping. In case you get lost, remember this; as long as you sniff horseshit (literally), you should be on the right path. Things to carry/wear: A bag pack with a good camera, money, some dry food like sandwiches (that won’t get soggy) or theplas (Gujarati snack), bananas, apples, energy bars, granola bar brownies, small juice packets, water bottle, cap, wind-fleece-jacket (preferably a light one), trekking shoes, trekking gloves and a muscle spray. You can also carry a flashlight in case you get down while it is dark. Medication for altitude sickness is a must if you have not been at these heights before. We survived on energy bars and water until hunger pangs struck on our way back down. Walking uphill for 4 kms makes you want warm food by the end of it. The cafeteria food wasn’t all that great so sandwiches will keep you sane until you find hot Maggie noodle soup at the base. Our tour guide was sweet enough to carry all our water bottles so we were free from a little weight. 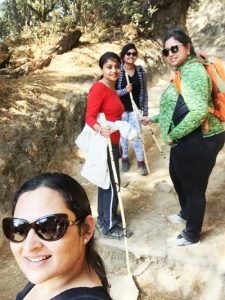 Trekking shoes would be helpful because there were a few short cuts we avoided because we wore normal sports shoes. Prepare yourself: Climb up and down six plus floors and avoid using the elevator for a month. Brisk walk (preferably jog) for an hour every day. Climbing and walking will help you reduce some weight, build your stamina and strengthen your leg muscles and knees. Practice breathing right; inhale with your nose and exhale with your mouth. Use this while you’re climbing to the Taktsang. Take your time: Start as early as possible so you have plenty of time to walk at a comfortable pace. Do not keep looking up wondering when you would reach the monastery. Just enjoy the journey. Tell yourself that you CAN climb and make a little effort to push yourself. Do rest (not for too long) if your heart is pounding or when you feel you need it so you don’t strain yourself or your muscles. Rent the stick: At the base camp, you can rent a walking stick for Nu. 50/- (INR 50/-) that will help you with your climbing. Generally, holding the stick for a number of hours in the cold may get your palms numb so it’s better to have trekking gloves that have a leather or rubber front so you have warm hands and a tight grip. Avoid wearing your jacket: Carry a light jacket because while you’re sweating on the way up, you may want to tuck it into your bag or tie it around your waist (like I did). The jacket is required because it tends to get windy up at the monastery. But, removing your jacket halfway makes you feel as light as air. Cafeteria and shopping: Honestly, I only rested at the cafeteria because I’m not a tea or coffee drinker and neither did the food nor service interest me, but you can refresh yourself there. The shop besides the cafeteria is way too expensive (more than the costs at Paro town), so wait until you get back down to the base and go crazy at the stalls there. For example, the wind chimes in the shop were being sold for Nu. 1000/- (INR 1000/-), while at the base stall we bought one for Nu. 250/-. Go on foot: Though there are ponies and horses to take you till the cafeteria, going on foot all the way is considered a blessing. Some of my friends preferred the short ride and view from atop the horse’s back so, its all up to you. 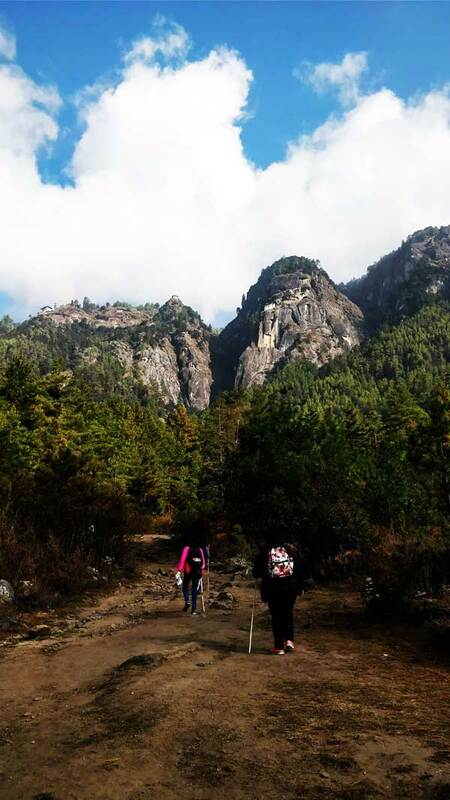 From the Taktsang, you have to get down on foot alone as sitting on the horses is way too dangerous due to the slippery gravel horse paths on the edge of the mud roads. Do not dirty the path: Clean up after yourself. Stuff your bag pocket with the trash until you find a bin to dispose it. The path is considered sacred to the disciples of Buddhism and they take great offence if you are seen throwing garbage around. Despite numerous tourists, the Tiger’s Nest is a full-fledged working monastery. 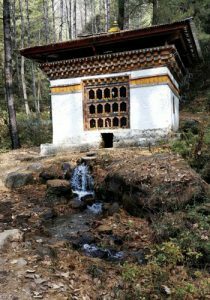 Go until the nest: You have travelled to Bhutan, trekked up to the monastery, then, just for the kick of it, you should get into the nest which is believed to have been the resting place of the tigress back in the eighth century. You crawl your way through a tiny door into a dark place and get down a narrow ladder which you feel may break with your weight. If you feel right, say your prayers and get down to the nest because if you slip there is only a SHEER DROP, so be careful. 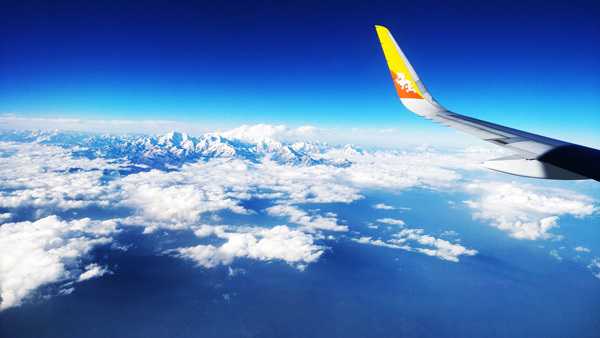 From the nest, you will get a glimpse of the Paro Valley through the little opening in the wall. Stand there for a while and indulge in your triumph. You are one of the few who climbed up 900 meters and had the guts to get into the mysterious nest. I am one of those too. High five! Some of us up at the Taktsang just before we got inside. Our driver has clearly photobombed our memory of the Tiger’s Nest. Haha! Once we reached the Tiger’s Nest, we patted our backs because it was a unique achievement and an unforgettable experience. Instead of writing a bunch of must-dos in Bhutan, I thought of compiling these tips as we were climbing to the Taktsang because we could have done with a little more information. Like when a friend sprained her leg, we thought the muscle spray would have lessened her pain on the way down, as we wanted to reach the base as fast as we could in order to shop. 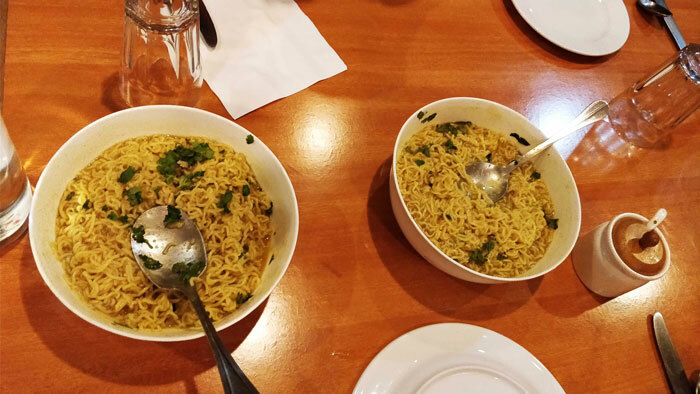 Yummy Maggie noodles (we had the privilege of buying the packets and getting it cooked for us at our hotel). As a conclusion, I’ll tell you more about the Tiger’s Nest. 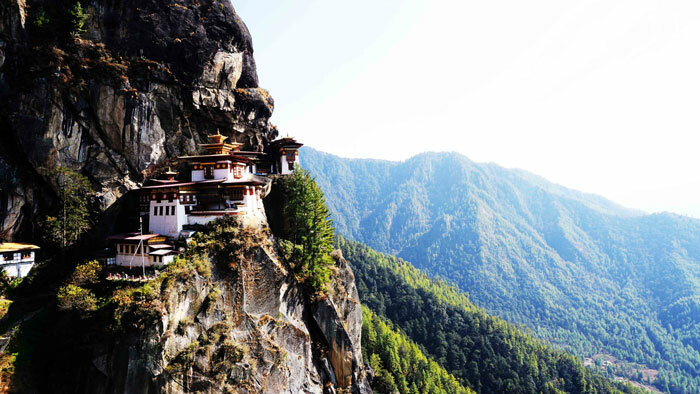 It is believed that Guru Padmasambhava (also known as Guru Rinpoche), who introduced Buddhism to Bhutan, meditated in a cave on this cliff in the eighth century. It is located near the Paro Chu (Chu is ‘water’ or ‘river’ in Bhutanese). He was flown there on the back of his tigress. 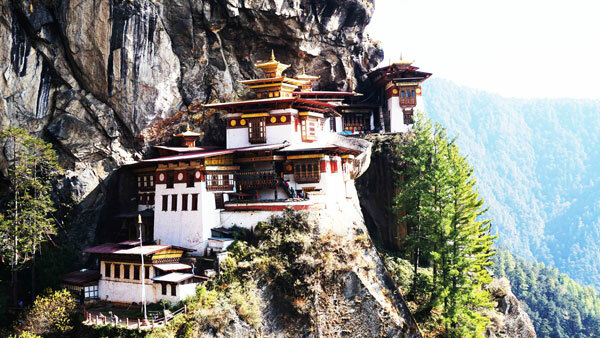 Later, the Tiger’s Nest was built in 1692 by Gyalse Tenzin Rabgye, Bhutan’s leader at the time. For various reasons, some people believe, that Gyalse Tenzin Rabgye was the reincarnation of Guru Rinpoche. The monastery was burnt down in 1998 due to a butter lamp and because of its isolated access, emergency assistance was impossible. It was rebuilt in 2005 and has been the cultural icon of Bhutan ever since. 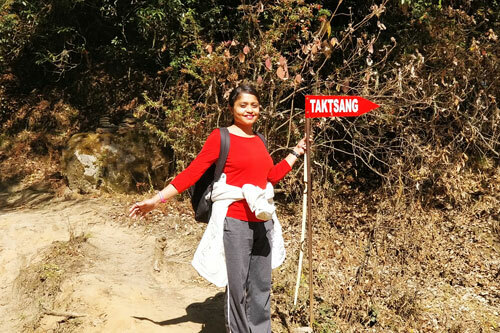 To book your Bhutan experience and retreat, you can contact Tshering Lhamtshok on +97517603482 or visit her website. To book a tour guide you can contact Karma on +975 17947937 or email him here. To book a hotel there, you can visit Summit Hotels. 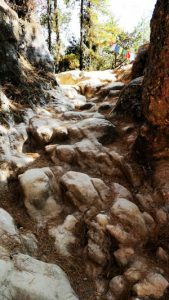 My trip around Bhutan in pictures.